Based upon our great success in branding Renelle on the River for Belgravia Group, Otherwise was invited to develop the brand for Three Sixty West, Belgravia’s boutique condominium project in the River North neighborhood. At the outset, we were tasked with intuiting and articulating the “head and heart” of this collection of 38 residences, and translating this brand positioning into a robust, integrated marketing campaign aimed at an audience looking for refined condominium living in a walkable, exciting neighborhood, without sacrificing luxury. 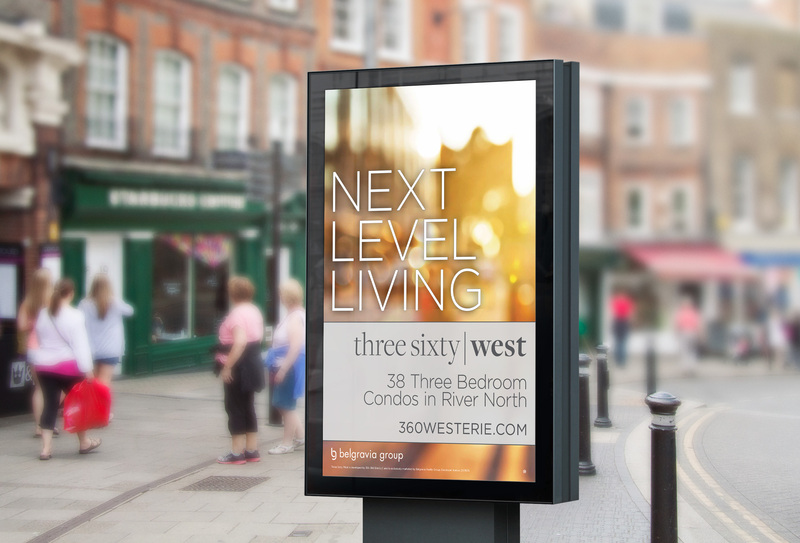 The campaign centers around the promise inherent in the street address and name — Three Sixty West. As reference to the degrees in a circle, Three Sixty West speaks to the notion of wholeness, promising a completely satisfying lifestyle through personalized and unique offerings. The brand promise followed —Next Level Living. Taken from the phrase to take something to the next level — an expression that conveys a desire to evolve from good to great— Next Level Living speaks to buyers who are already thriving, but aspire to further elevate and enhance their urban lifestyle. With the brand promise in place, we developed an engaging visual identity that lays the groundwork for a holisitic system of marketing platforms— website, collateral, advertising (digital, print and out of home), and graphics for the Sales Center (interior and exterior). The result is a refined campaign that integrates the language of the brand promise. The logo uses a serif font that evokes a feeling of luxury, and is executed with a color palette that speaks to the subtle and unique elegance of Three Sixty West living. A subtle background pattern is introduced to collateral, representing motion on many levels and the aspiration of soaring upward.